I managed to finish quite a few paintings in Ireland, and made many sketches to work from later, as well. County Mayo is a beautiful part of Ireland and a varied and dynamic landscape. The light and weather changes there so quickly that it helped to work smaller and try to complete paintings in one session. 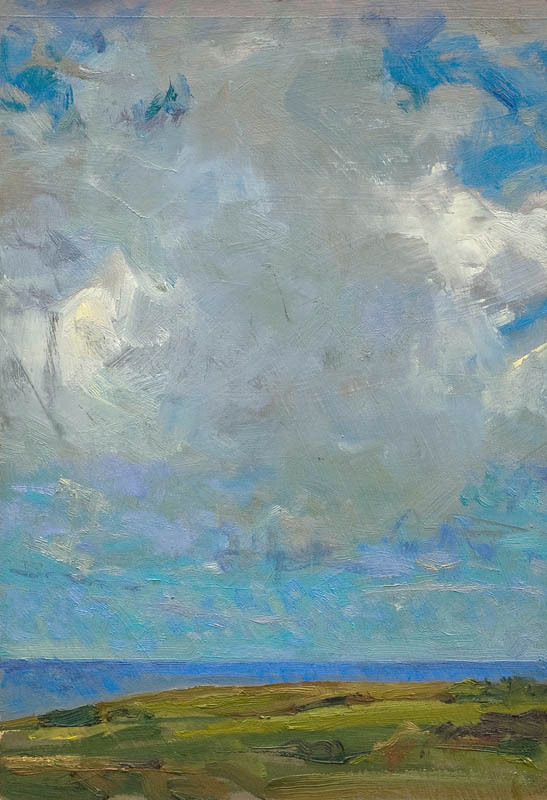 Revisiting a painting on a second or third day usually meant a complete renegotiation of the palette, composition, and the general focus of the image. Often, the weather was extreme enough to preclude it entirely. That’s always a possibility of that with outdoor painting, but it seemed especially so in Ireland. Ballycastle is a small village, about a mile from the edge of the North Atlantic, surrounded by working farms and pastures full of sheep and cows, many that edge up to or jut out above the ocean. The people were great, and the area was lush, even in a summer that lacked rain (to the degree that water rationing was suggested for parts of Mayo, until the rains returned in July). The residency was quite an opportunity. Many artists came and went while I was there, as my stay was one of the longest this summer, and it was really interesting to see how other artists responded to the same environment. Una Forde and Christine Tighe from the Ballinglen Arts Foundation were very helpful and generous with their suggestions and information about County Mayo and places of potential interest for the artists. The sea cliffs were stunning, often with drops of hundreds of feet to the ocean, and the bogs (where peat is cut for heating and bog cotton grows in the summer), reminded me of the tundra in Alaska. Viewed from a distance, the yellow/brown colors and low growth on the bogs gave a look closer to parts of the desert southwest in the US than I would have expected. Many places I painted are on private land, but are open for hiking (or painting) as part of a system of Looped Walks throughout Ireland. It is quite a transition to go from the population density of southern California to areas that I was able to explore in Mayo, where often I would not see another person on a three or four hour hike through areas of absolutely stunning beauty. Many days while working near the Atlantic, where the wind is strongest, I made drawings or took notes. 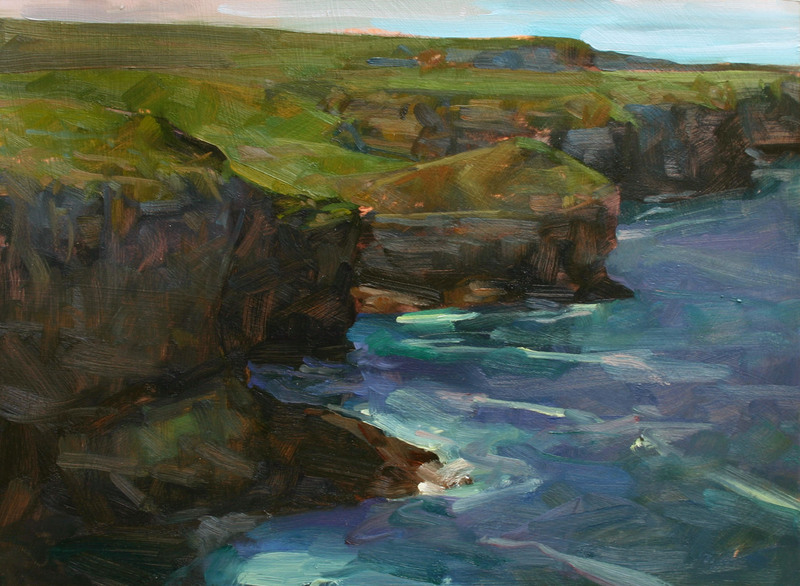 Other days I struggled against the wind with my easel on the cliff edges, beach rocks or bog. It’s a tough way to work, but a spectacular place to attempt it. Here are a few of the paintings. I will be posting more later to my regular web site. 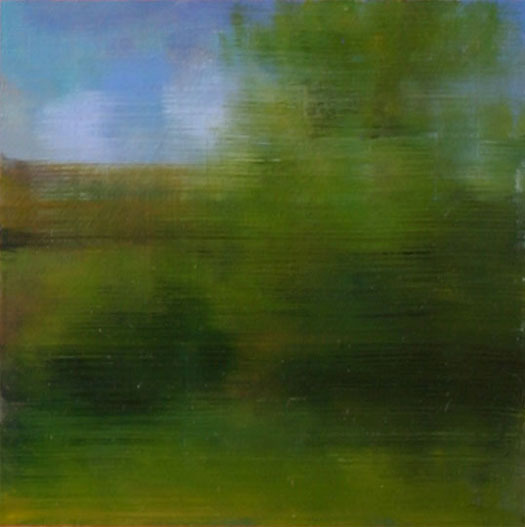 This entry was posted in Europe, Ireland, Landscape Painting, Painting Trips and tagged County Mayo, experiential, Ireland, perceptual painting on July 17, 2010 by Joe Forkan. Joe, I really enjoyed seeing your paintings. I especially loved the “downpour” painting. It must be quite a beautiful place. These are amazing, Joe. Sounds like you had a fantastic experience. Downpour is wonderful – really captures it.